Chinese Human Rights Lawyer Sentenced To More Than 4 Years In Prison Wang Quanzhang was arrested in 2015 along with hundreds of other legal activists. Human rights groups say the sentence makes a mockery of the rule of law. Activists hold a sign showing detained Chinese human rights lawyer Wang Quanzhang at a rally outside the Chinese Liaison Office in Hong Kong on Dec. 26, 2018, as Wang's trial was set to begin in China. A prominent Chinese human rights lawyer has been sentenced to 4 1/2 years in prison for subverting state power. Wang Quanzhang is known for defending political activists, victims of land seizures and the banned religious group Falun Gong. His wife and former business partners say Wang committed no crime. Human rights groups are condemning the sentence. Wang was arrested in 2015 as part of a mass incarceration of legal activists. Most of the other activists detained in what is known as the "709 crackdown" — for July 9, the date most of them were taken — have since been sentenced or released. Wang was the last to be sentenced. "Wang's case stands out for the length of time he has been kept incommunicado — 3 1/2 years — prompting a U.N. rights group to call on Beijing to release him," NPR's Shanghai correspondent Rob Schmitz reports. Li Wenzu, the wife of imprisoned lawyer Wang Quanzhang, reacts before an interview at her home in Beijing. Wang, a prominent Chinese human rights lawyer, was sentenced on Jan. 28 to 4 1/2 years in prison for state subversion. Wang's prison term was lighter than expected, Schmitz says, and if he gets credit for the time he has been in detention, he could be released as early as next year. 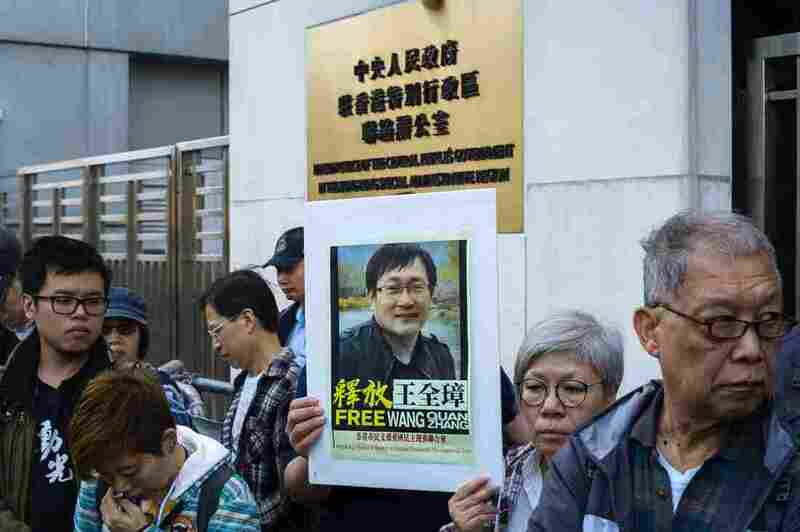 But Wang's sentence has still drawn widespread condemnation from human rights groups and critics of the Chinese government, which routinely surveils dissidents and often takes them into custody. Amnesty International China researcher Doriane Lau called the sentence a "gross injustice," saying in a statement: "It's outrageous that Wang Quanzhang is being punished for peacefully standing up for human rights in China. He must be immediately and unconditionally released." As part of the Chinese court's ruling, Wang will also be "deprived of political rights" for five years. In practice, CNN reports, this means he loses his freedom of speech and can't hold government-related jobs. The Guardian says he will be stripped of his law license. Wang's wife, Li Wenzu, told the Associated Press that she worries about her husband's health while incarcerated. He "never committed a crime," she said. "I firmly refuse to recognize or accept this result." Wang was indicted in part owing to his work with China Action, a group of human rights defenders operating in China. China Action co-founder Peter Dahlin wrote last month that "No part of 'China Action's' work, focused on training of lawyers in Chinese law, providing legal representation and aid, nor its research and limited reporting, in any way constitute subversion of state power." Wang's guilty sentence, Dahlin tweeted, is "a mockery of the very thought of 'law' in China." Chinese media were instructed not to report on the sentencing, according to China Digital Times. In the lead-up to the 2015 crackdown on human rights lawyers, the Chinese government had warned the attorneys to tread carefully, NPR's Anthony Kuhn reported at the time. The government told them to "not take on politically sensitive cases. Do not defend any more dissidents," Kuhn reported. "Remember that this is all under the administration of a president, Xi Jinping, who claims to be advancing the rule of law in China and ending miscarriages of justice." China continues to take dissidents into custody. Just last week, Chinese-Australian writer and former diplomat Yang Hengjun was detained by Chinese authorities, NPR reported. His lawyer told CNN that Yang has been charged with espionage. In a letter written years before this arrest, Yang gave supporters guidance in case of his disappearance. He asked them to "maintain belief in China's democratic future, and, when it doesn't put yourself or your family at risk, to use all your means to push China's democratic development to happen sooner," he wrote, as reported by the Sydney Morning Herald. "If I can come out, I will continue my work. If I cannot come out or disappear again, remember my articles and let your children read them."